It is quite hard to imagine how a son of freed, black slaves could start up and manage a flourishing oyster business almost 200 years ago during the polarising antebellum period, the age of slavery and violent oppression of blacks, and be so mourned as a highly respected member of the community that the New York Chamber of Commerce closed for his funeral in 1866. 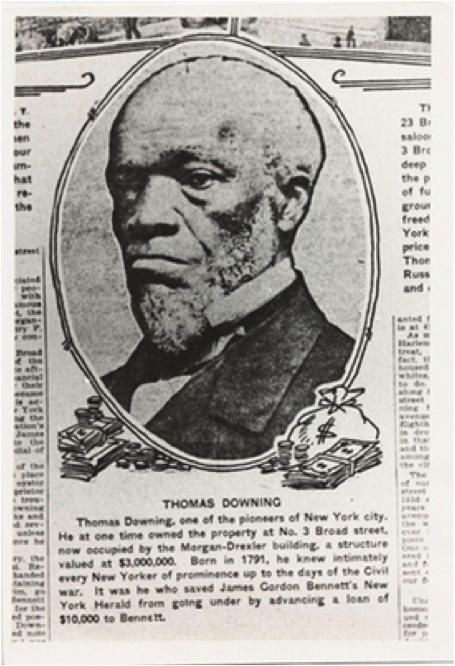 Thomas Downing, born in 1791, was the son of black slaves, who had been owned by a land-owning family, whose head in the middle of the 18th century was a Captain John Downing, a Methodist, who was persuaded to manumit his slaves as it was deemed contrary to his Christian beliefs. Thomas Downing’s parents, who assumed their former owner’s rather famous name, had been appointed caretakers of the church’s meeting-house, established by the Downing family in 1783, in Accomack county, Virginia, on the eastern side of the Chesapeake bay. The church is still standing in Oak Hall, although it was rebuilt after the original structure burnt down in 1854. They also managed to acquire land, near the inlets around Chincoteague island, land probably allocated to them by their previous owner. The young Thomas, born free in a state that condoned slavery, had playmates that were white children of the local well-to-do, one of whom was to become the governor of Virginia, Henry Wise. Even as a youngster, he learnt how to rake and harvest oysters, dig for clams and generally work on the land, which bordered the Atlantic coast. His parents’ home was depicted later as “humble and unpretending, but bore the impress of industry, taste and happiness”. Family members “were famed for their strength, agility and general aptness, and enjoyed the reputation of being ready and able to defend their rights” (Washington, 1910). He left his home, “not being satisfied”, according to the same account, to serve with the young United States troops against the British in the War of 1812, like many other blacks, travelling north, and afterwards settled for a time in Philadelphia where he met his future wife, Rebecca West, before deciding to go to New York, in 1819. One of the reasons for him coming to New York may have been his interest and expertise in handling oysters, for on arrival in New York he soon registered as an oysterman, which at the time was an occupation often held by freed blacks, most of whom had settled on Staten Island, an area that provided a free haven for black families. Indeed, racial discrimination seemed generally slacker on the waterways, as was evidential in the Chesapeake Bay as well (Keiner, 2010), where many in the oyster business were black Americans. In 1810, of the 27 oystermen listed in the New York City directory, at least 16 were free black Americans. And it seems that it was mainly blacks who were running the oyster bars in the city, as well as many of the dance halls and saloons. And as Charles Dickens was later to remark in his American Notes, New York was full of oyster cellars, marked by their distinctive sign of a red, glowing globe: “signs which are so plentiful, in shape like river buoys, or small balloons, hoisted by cords to poles, and dangling there, announce, as you may see by looking, ‘Oysters in every Style’” (Dickens, 1842, Ch 6). Another reason may have been the existence of quite an independent community of blacks, mostly free slaves, who were later granted the right to vote in 1821 although slavery was not abolished until 1827. The first school for blacks in North America had been established in the city at the end of the 18th century, but slavery was important for the economy of the city as a trading post between Europe and the South. So it may have felt more of a safe haven than anywhere else at that time. Dickens also commented on the interracial culture of New York’s nightlife in the same book. Blacks had also begun to organise themselves into civic organisations, churches and some tried to involve themselves in politics. It would seem from this description that New York offered a vibrant and possibly welcoming environment for a young and obviously ambitious man with a surname that rang many of the right bells in the city. He bought himself a boat and started in the oyster business, which would make a lot of sense, given his previous experience back in Virginia. He was said to have loved his oysters as well and after a few years decided to set up a shop where he could sell the oysters he harvested. He was known even to go out on the prowl in the dead of night to negotiate with local oystermen on their way into harbour and buy the best on offer before they were auctioned off or stole off in a skiff to tong his own from the flats of the New Jersey side of the Hudson River which were loaded with “superior oysters”. His son characterised him as being an “extremely active” man “who knew not tire” (Washington, 1910). This establishment, that could only serve white clients in those segregated times, soon became renowned for its plush decorations so much so that it became an institution, strategically located on the corner of Broad and Wall Street, close to the important centres of commerce, the banks, the Customs House, the Merchants’ Exchange and departmental stores. It was known as Downing’s Oyster House, opened in 1825, initially as an “oyster refectory”. Despite its obligatory red lamp hanging outside, its interiors were lush and ornamental with soft carpets, damask curtains, gold-leaf carvings, chandeliers and mirrored hallways. His was the only oyster-house that attracted the aristocracy, the elite of white society – politicians, rich businessmen, intellectuals, professionals and foreign dignitaries as well as ladies in the company of their husbands or chaperons and the most respected families of the city came to “enjoy a repast which would cause their sons and daughters to long for frequent repetitions”, as his son would later recall. “Ladies and gentlemen with towels in hand, and an English oyster knife made for the purpose, would open their own oysters, drop into the burning hot concaved shell a lump of sweet butter and other seasonings, and partake of a treat. Yes, there was a taste imparted by the saline and lime substances in which the juice of the oyster reached boiling heat that made it a delicate morsel. Truly, one worthy to be borne to the lips that sipped from the shell the nectareous mite” (Hewitt, 1993). How these words convey the exuberance and reverence held for these savoury molluscs! Thomas Downing was proud that he could offer his guests the finest and freshest oysters that were available and was known to treat the captains of the local oyster vessels in a generous manner, which brought oysters from various points along the eastern seaboard. All imaginary oyster dishes were served, not only fried, stewed, roasted, steamed, scalloped, in pies but also with other fish and fowl. 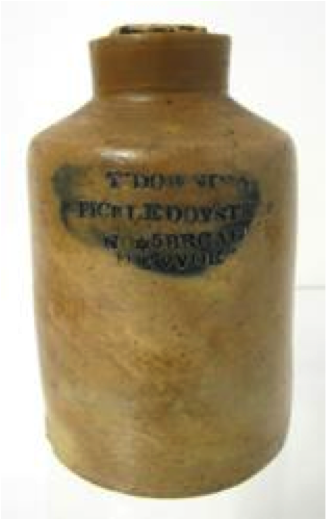 He marketed his own pickled oysters in stone jars or crocks, which were stamped in dark blue lettering with his own name and address, nowadays a rare collectors’ item. However, as his business grew, and he extended his premises to neighbouring buildings on both sides, he was not merely satisfied with providing oysters in various shapes and forms, but he built up a catering enterprise as well, to which early 19th century events managers turned to provide the food whenever a new steam-boat was to be launched, or any big company opened up its doors or some socialite decided to throw a party or for special governmental occasions. “The great man of oysters” was asked to provide the refreshments for the ‘Boz’ Ball that was arranged to welcome Charles Dickens in 1842 to the city, when over 3000 New Yorkers turned up in his honour. It was a massive event, impressing the British writer who was treated like a modern-day pop star: included in the sumptuous feast were 50,000 oysters, 10,000 sandwiches, 40 hams, 76 tongues, 50 rounds of beef, 50 jellied turkeys, 50 pairs of chicken, 25 of duck and 2,000 mutton chops – before the deserts were brought out! He was paid $2,200 for his efforts, a princely sum in those days. Talented, runaway black slaves were among the first Afro-American entertainers in colonial and antebellum America, and it was often in oyster houses and saloons that such entertainment was provided. One famous black dancer was known as Master Juba, who toured Europe, attracting full houses of admirers. And it was in New York that the first free black community founded its own theatre group in 1821, the African Grove Theater. Brooklyn could claim its own Thomas Downing in the shape of a freed slave from Martinique called Johnny Joseph, popularly known as Johnny Jo. He too opened an oyster parlour on Prospect Street, which became a local landmark, attracting various professional groups who used it as a social club for their members. Seen from our perspective today, it would be easy to view these clubs as setting a standard and precedent for what later became the city’s dynamic jazz clubs of the early 20th century. As Kurlansky remarked (2006, 230), Downing’s had become a New York trademark, exporting his oysters even to Paris and London. Queen Victoria showed him her gratitude by sending him a gold chronometer watch in appreciation for the oysters he had shipped over to her. He even managed to save the New York Herald newspaper from going bankrupt by advancing its founder, Gordon Bennett, a loan of $10.000. And that all this took place just a few years after the abolishment of slavery in New York in 1827 is even all the more surprising! Unbeknown to many of his clients, he and his family had joined the so-called Underground Railway, founded 1830, a network of secret routes and safe houses, that helped black slaves escape either down to Florida, then a Spanish colony or to British North America (Canada) during the first half of the 19th century. It seemed as though his premises were used as one of the stations to hide fleeing slaves en route north. His cellars were used for this purpose and his son was later to recall how they harboured many a runaway slave. He helped found an all-black United Anti-Slavery Society of the City of New York in 1836. He had got himself involved in improving the quality of education for black children in the African Free Schools. Although freed blacks had been granted the vote in 1821, there were severe restrictions attached, mainly regarding residence and property qualifications that few blacks were able to meet. In his fight against such discrimination, Downing championed the cause of equal voting rights for every citizen, irrespective of colour and participated in a black organisation petitioning the State legislature in Albany from the end of the 1830’s onwards, though he did not live long enough to see it achieved in 1870. His religious beliefs were strong, and he soon joined the only black congregation in New York, the St. Philips Episcopal Church on Mulberry Street, initially called the Free African Church of St Philips. As a man known for his generosity, he supported not only the church, but also donated money to those in need and joined various benevolent organisations like the Prince Hall Freemasonry, the Odd Fellows and other charities so that one New York newspaper referred to him as “one of the most respectable and aged colored men in this city. His private character is without reproach….” and praised him for his humility and modesty and for “the magnitude of his donations for the relief of his oppressed race” (Hewitt, 2000). Other contemporary mentions of him seem to concur on this very point, that his magnanimity was accompanied by a certain reserve, strict integrity and strongly held principles and all this may be detected in the only portrait of him that has survived. One such account described him as “the former venerable Ethiop”. This image of a prominent leader of his community, and of someone who held firm views on the injustices of the day is replicated in the words of his eldest son George, who himself followed in his father’s footsteps, taking over the oyster business, and then became a very successful restaurateur in his own right, with good connections with the white, political establishment of Rhode Island, Boston and Washington. He was said to have inherited his father’s “commanding figure and kingly bearing, his aggressive temperament and manly character…he was reared under Christian influences and taught to stand up for his rights, as well as of the weaker ones, and repel invasion, by force if necessary” (Washington, 1910). Thomas Downing managed to survive the violent race riots during the four-year bloody Civil War (1861-1865), when blacks were randomly lynched and murdered on the streets of the city, having been blamed for the slaughter and suffering inflicted on the Unionist troops. So after a successful life in the oyster business, having been a tireless advocate of black rights, the abolitionist movement, equal suffrage and accessibility of high-school education for black children, as well as a generous donor to African-American charitable causes, he died a wealthy man in 1866, and as a mark of respect the New York City Chamber of Commerce closed for the day of his funeral. Dickens, C. (1842): American Notes for General Circulation. London: Chapman & Hall. Hewitt, J. H. (1993): Mr Downing and his Oyster House. New York History, 74, (3) 229-52. Hewitt, J.H. (2000): Progress and Protest: New York’s first black Episcopal church fights racism. New York: Garland. Keiner, C. (2010): The Oyster Question. Athens: The University of Georgia Press. Kurlansky, M. (2006): The Big Oyster. New York: Ballantine Books. Washington, S.A.M. (1910): George Thomas Downing; sketch of his life and times. Newport: Milne Printery.